The hearing tomorrow stems from a violation citation filed on Sept. 2, just five days before Merlino was to complete the three years of supervised release that were part of his sentence following his conviction for racketeering in 2001. Ciancaglini was a co-defendant in that case. Merlino relocated to Florida after being released from prison in September 2011. He had served nearly 12 years of a 14-year sentence. With the permission of the probation department, he opted to settle in the Boca Raton area rather than return to South Philadelphia. His presence in South Florida has not gone unnoticed by both the media and law enforcement. But his lawyers, Edwin Jaocbs Jr. and Michael Myers, argued in a motion filed earlier this week that Merlino had been "scrupulously" abiding by the conditions of his probation and reported any encounter he had with a convicted felon. Under the terms of his probation, Merlino was prohibited from associating with known organized crime figures or convicted felons. If found in violation, he could be sent back to prison, placed on some form of house arrest or have his probation extended. In their motion, Jacobs and Myers continually referred to Merlino as 'Joseph," as in, "Anxious to leave his past behind, Joseph began carving out a new life for himself in Boca Raton" and "For the last three years, Joseph has scrupulously abided by the conditions of his supervised release." There are at least a dozen references to Merlino in which only his first name is used. The lawyers argued that the government's citation was based on faulty allegations. They also contended that the summons had not been issued in a timely fashion and that Merlino's actual probation period had expired before he was formally cited. In a counter-motion filed by Assistant U.S. Attorney David Troyer, the prosecution said any delay was at the request of Jacobs and that both he and Merlino were properly notified on Sept. 2, five days before Merlino was scheduled to complete his three-year stint of supervised release. The citation cites two alleged violations. In May, Merlino refused during a government deposition to reply to a prosecutor's question about any financial dealings he may have had with a suspected organized crime figure. Merlino instead exercised his Fifth Amendment right against self-incrimination and declined to answer. The deposition was part of a civil action brought by the U.S. Attorney's Office in Philadelphia to determine Merlino's finances. 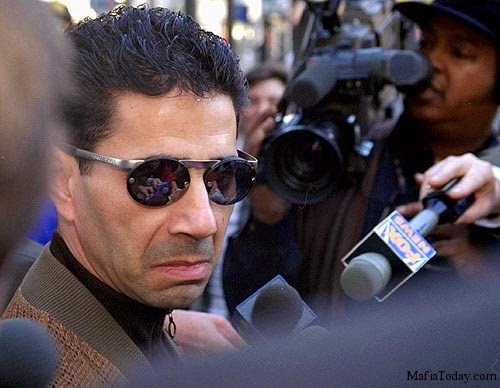 In addition to his prison sentence, Merlino was fined $25,000 and ordered to pay $337,943.89 in restitution following his 2001 racketeering conviction. Merlino's sources of income have been a topic of debate in law enforcement and underworld circles since his release three years ago. He has maintained residences in upscale condos and townhouses in the Boca Raton area, frequents high end restaurants and night spots and is a regular at a popular gym. There are those who believe that despite his denials and his insistence that he has left South Philadelphia and the mob life behind, Merlino continues to have a "piece of the action," and that associates routinely send him or bring him cash. A second violation, the government alleges, occurred on June 18 when Merlino was spotted in the presence of Ciancaglini and two local men Brad Sirkin and Frank Fiore. All three are convicted felons. According to the citation filed in federal court, Broward County Sheriff's Department detectives had Merlino under surveillance on the night of June 18 and spotted him meeting with those three individuals in the parking lot of La Villetta, a popular Italian restaurant. The detectives then followed the group to Havana Nights, a cigar bar owned by Fiore. Two detectives who entered the cigar bar said Merlino was in the VIP section with Ciancaglini and the others, according to court papers. Merlino's lawyers have argued that the association that night was a "chance encounter." They contend there is no evidence supporting any allegation that Merlino was interacting with the others. Rather, they say, he happened to be at the same place at the same time. They argued repeatedly that "Joseph" was committed to starting a new life; that he had a job with a marketing and advertising company and that he was doing volunteer work with a drug rehab center and a foundation that provides training and education for those with autism. They also said that "Joseph" had recently arranged for his wife Deborah Wells-Merlino and their youngest daughter to relocate from Ocean Township, NJ, to Boca Raton. The couple's older daughter is now attending college. The move, the lawyers said, was further proof that "Joseph" was attempting to start a new life in Florida. Why else, they argued, would he ask his wife and daughter to uproot themselves and why would he "knowingly risk jeopardizing everything he had spent years working to achieve." Prosecutors, in their motion, seemed less than convinced that Merlino -- they NEVER referred to him as "Joseph" -- had left the mob life behind. "Merlino was the leader of the Philadelphia family of the La Cosa Nostra," Troyer wrote in his motion. "His suggestion that his meetings with convicted felons and LCN members and associates were mere 'chance encounters' is laughable, and is belied by the evidence. Equally preposterous is his suggestion that he did not know that he could not associate with the persons with whom he is alleged to have met." Troyer went on to note that in the 1990s, while on probation in a different case, Merlino was guilty of the same offenses. "He fully understands the seriousness of such violations," the prosecutor argued. "John Ciancaglini was a co-defendant of Merlino’s in the instant case. Frank Fiore is a convicted fraudster. Bradley Sirkin, who is related to a capo in the Lucchese crime family, is also a convicted felon. In fact, by Merlino’s own admission in his memorandum of law, Merlino met Sirkin in a federal halfway house. Any suggestion that Merlino did not know that these were prohibited persons is patently unreasonable." The prosecutor also said the government was prepared to back up its allegations with evidence and photos. He wrote that while in a halfway house in Florida prior to the start of his probation, "Merlino had off-site meetings with convicted felons and known LCN members and associates. Photographs of these meetings have been provided to defense counsel in discovery." Joseph did not answer questions about his finances because he is living off mommy's purse strings, who got her money from Joseph's father who was a real money maker back in the day. George, I doubt that both daughters are named "Sophia," as you wrote. Might want to clarify that (or just omit the daughters' names, which are probably not matters of legitimate public concern). Thank you. Good point. Made the changes. I was curious i thought nephew would have told uncle Joe to sit this one out now that he was no longer in jail. Anyone know when Martys coming home. I don't know if they will get Ligambi for that murder; but I think he will definitely get charged for having Long John and Johnny Gongs Killed. George A.what is your opinion on that ? Everyone knows Uncle Joe Had Damien and Nicodemo murder Johnny Gongs. I guess it depends on what Nicodemo does but Ligambi has a bigger problem to tackle first with the insurance fraud and Murder for hire on the Rayos. Jerome Walker and Ron Galati will both give him up now that Galati is looking at life. When do you think the Feds are going to take over the Galati cases that are left and arrest Joe Ligambi ? I agree but take it from one who knows Jerome Johnson may know something about the Rocco Manascalco hit andi that's going to involve Ligambi and maybe his nephew to. George A. Did you hear anything about that from your inside sources? If I was the Feds the question I would ask Merlino is, how come when u talked to Nicky Skins you notified your PO cause he was an OC figure but you didn't know to do that when it came to Johnny Chang? Is Georgie still wearing his Sox cap in South Philly?